dB Technologies have been major players in the sound system stakes for mobile DJs for some time now. An Italian based company, their tech team are always striving for the next innovation and development. dB has become synonymous with quality products that deliver unmatched performance for the price. dB Technologies currently have various speaker ranges to suit all budgets and applications from entry level to top of the range. In this issue, we will be taking a closer look at the Opera DX series and the Sigma series. Having used the Opera 400s for many years, I was very excited to have the opportunity to listen to the new development from dB; the Opera DX. 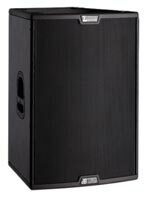 They are full range powered speakers with 3 lines, the 500, 700 and 900 series. The 500 series has the option of 8", 10", 12" and 15" woofer, whereas the 700 and 900 series are available with 10", 12" and 15" woofer. They've made the model numbers easy to understand; for example an Opera 712DX has a 700 watt amp with a 12" woofer. This series of active speakers boasts dB's innovative 'digipro' G2 digital powered amps which give it a superior sound quality. Although these are meaty and powerful speakers, dB have definitely been mindful of the weight which makes them a perfect choice for mobile DJs, combining style and high performance. For something a little bit different in portable powered speakers, the Sigma series has got to be the answer. The endearing feature is their ability to be mixed and matched and stacked (try saying that quickly!). These are definitely designed for bodybuilding DJs, due to their weight, but the sound produced by these meaty beefy speakers is well worth it. The power doesn't detract from a warm sound with crystal clear high end and a massive base response. We're not talking waistlines here (even though we had too many Easter eggs). AMPdj is now part of the AMPuk Group. This expansion will mean even greater resources are available to benefit our members. We've just completed a mail out to over 6,000 hotels and venues around the country, letting them know about our AMPdj members and how to book them for events. AMPdj is already the largest DJ Organisation in the UK; recognised by more venues, clients & DJs. Our current campaign is designed to build on this achievement even further. The contents of this Infomail are ©AMPdj 2013. It can be reproduced in whole or in part elsewhere provided a clear link to the original (i.e. this page) is included. Sat 27th Apr 2013, 12-4pm. Fabtronic, Moulton Park, Northampton, NN3 6GL. 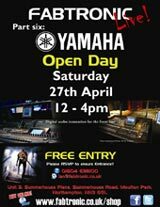 Yamaha have a mass of exciting products for most applications.In addition to having the industry experts at your disposal we might be giving away some Yamaha swag on the day. BPM 2013 at the NEC, Birmingham. We'll keep you updated as the show draws closer but in the meantime make a note in your diary as it is earlier than previous years. You can read what DJ Hank has been up to recently in the next edition of Pro Mobile magazine out in May and follow him on YouTube. Know someone who might be interested in this website or service? "When I started DJ'ing, it was no big thing. There was no money in DJ'ing, and you did it purely for the love of playing music."